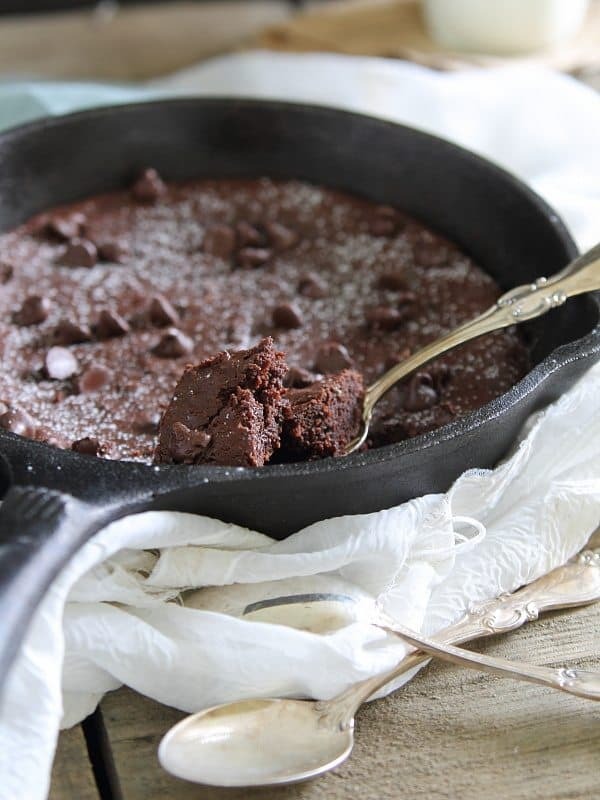 This fudgy paleo skillet brownie is completely decadent and chocolatey and with no added sugar! I’ve been wanting to make skillet brownies for quite awhile now so talking about gluten free families and kids as part of my ongoing work with Udi’s seemed like the perfect time. What kid doesn’t like a brownie?! When I make desserts, they tend to fit into a paleo or gluten-free label by default. I don’t really set out with the expectation to make them that way, it’s just that my preference over time has shifted from wanting massive amounts of sugar to naturally sweetened things and typical all-purpose flour usage to better for you whole grains or gluten free options. It’s hard to imagine “having to” eat a certain way but if that was forced upon me, I can tell you one thing, there better be a damn good brownie recipe that fit the mold. Although boxed brownie mixes would like you to think there’s a choice in the matter, I firmly believe there should only be one type of brownie in this world, fudgy. If you want “cake-like” make a cake, not a brownie. I’ve made my fair share of “healthy” brownies that came out nowhere near the fudge-like consistency I wanted. Honestly, these pumpkin brownies are one of them. I should really re-do that recipe! This isn’t one of those times though. 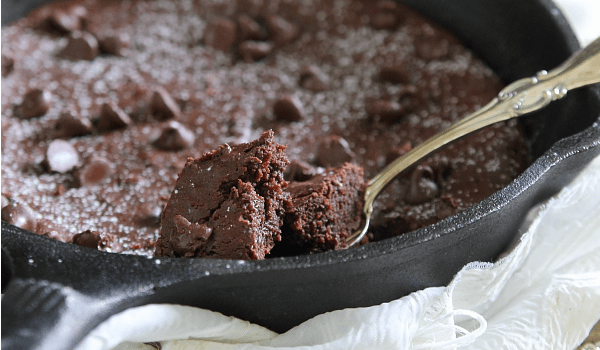 This paleo skillet brownie is chocolatey, fudgy and decadent and the best part is there’s no added sugar, just a bit of mashed banana for some natural sweetness but not enough that it tastes “banana-y” at all (because bananas have no business in brownies). Want another fudgy brownie recipe to try? These superfood brownies are outrageous! This is one of those recipes you can easily bring to a party or bake up for the family and no one would be the wiser that there’s some paleo or gluten free label attached. It’s also a really great Valentine’s Day dessert option. Grab two spoons and dig in, I bet you’ll both finish the entire skillet. 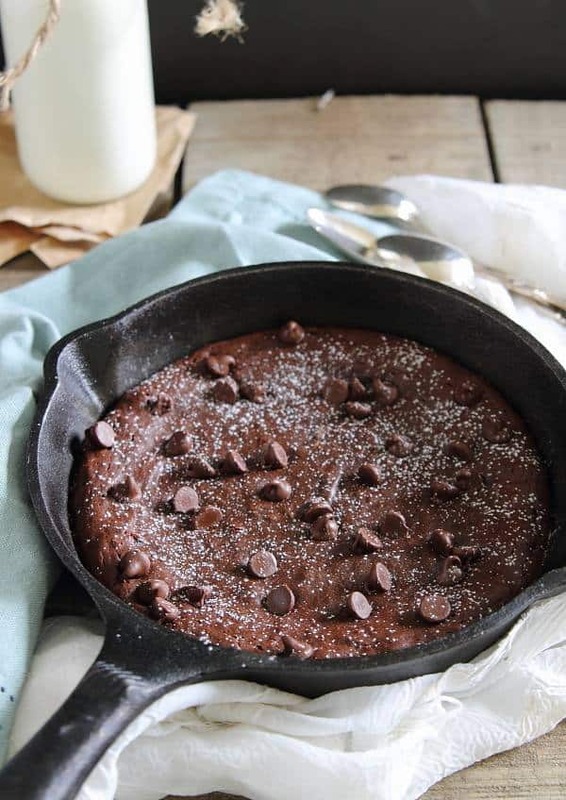 Just a good ‘ol fudgy skillet brownie everyone will love. That happens to be paleo. And if you’re wondering what that ice cream is on top – it’s this sweet corn bacon ice cream. It’s amazingly delicious (although not paleo) but good ‘ol vanilla will work just as well. 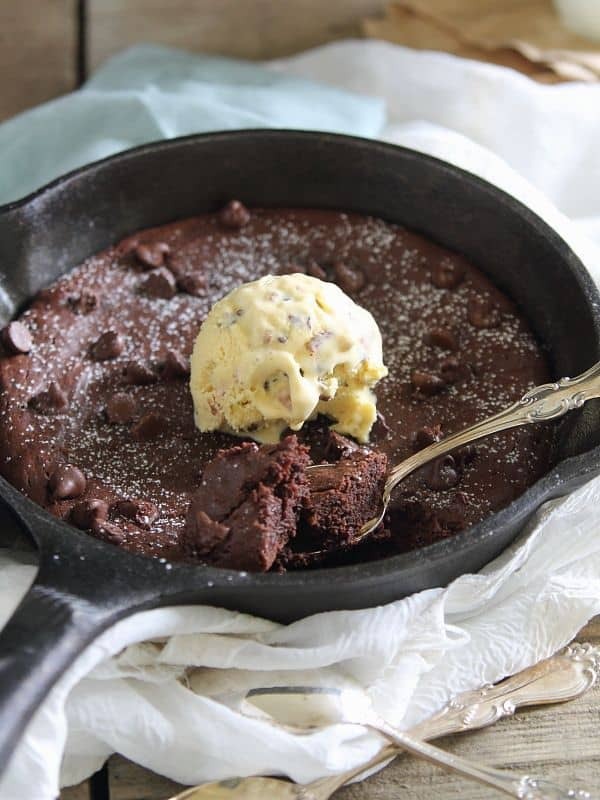 Honestly though, this paleo skillet brownie is so fudgy, no ice cream is even needed! Grease an 8 inch cast iron skillet well with butter or coconut oil. Preheat oven to 350 degrees. Melt the coconut oil and chocolate chips in a medium bowl. Stir until well combined. Add the mashed banana, salt and vanilla and whisk together. Add both flours and stir until just combined. Transfer the batter to the skillet, top with additional chocolate chips if desired and bake for 20-22 minutes until the edges start to pull away from the sides and the middle is still just slightly undercooked. Looks so good! I love the added ice cream at the end!!! Oh my these look amazing and I have almost everything to make them! Love it! A paleo brownie??? Where have you been all my life?! This looks amazing! I was wondering if the skillet has to be cast iron, or if another oven-safe pan would be okay. I want this brownie in my life! It looks scrumptious! is restricted as to what she is allowed to say and what she is allowed to read. Amazing. My new go to paleo/no honey or maple syrup added brownie recipe… So good!!! I so need to make these brownies! They look fabulously fudgy! Looks delicious! I can’t have bananas, so what can I substitute for it? Thank you for sharing this! What type of ice cream is pictured? It’s sweet corn bacon cacao nib ice cream (recipe on the site) that I had on hand at the time of shooting these photographs. These look amazing! But, is there something I can use in place of the coconut oil? Butter or ghee or if you wanted, veg/canola oil would do as well. Hello! Question: Can you replace oil with walnuts or other oily nuts pulsed in the processor??? Thanks in advance! I haven’t tried that but wouldn’t recommend it. Paleo baking is finicky enough as is, substitutes like that would probably throw the ratios off. Looks good, The bananas flavor it will come out? Or not? What’s is the dominant flavor? no, you really don’t taste the banana, it’s such a small amount. The dominant flavor is chocolate. Made these tonight. I used semi sweet chocolate chips because that’s what I had. Yummy brownies! Take care to under bake them. Curious, but what was sprinkled on top at the end? Powdered sugar? I’m currently eating Paleo, but looking for a good chocolate *insert yummy dessert here* recipe that doesn’t have refined sugar involved.